PayPal Money Adder scam - NOT FREE MONEY found on the Internet! Home > Avoid scams > PayPal Money Adder scam – NOT FREE MONEY found on the Internet! PayPal Money Adder scam – NOT FREE MONEY found on the Internet! Will PayPal Money Adder scam you or will it send money to your account and make you happy? Well, first of all I need to congratulate you for taking the time to do your own research before getting involved in another money-making opportunity. There are too many scams out there so doing your due diligence is the way to avoid scams and find the real way to earn money online! I know it would be amazing to have a tool that sends money to your PayPal account but the ugly truth is that these tools or softwares don’t work. My PayPal Money Adder review will show you how these softwares really operate and why you need to avoid them at all costs. 2 What is PayPal Money Adder about? What is PayPal Money Adder about? Who wouldn’t like to receive free money on their PayPal account? I personally don’t know anyone who wouldn’t like that. 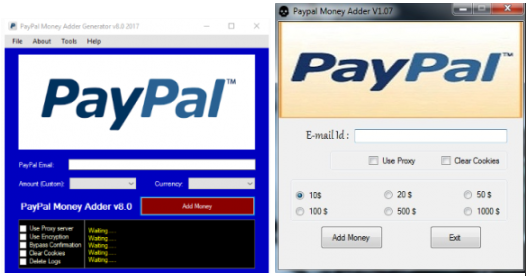 A PayPal Money Adder is also known as a PayPal Money Generator, which is a tool or software that claims to put free money in any PayPal account that you have. Some of them say that you can get $500 a day deposited into your account. Sounds great? All you need to do is select the amount of money you want and give them your personal info like your name and your Paypal email address. The fact that doing this is completely free is something that can make this very attractive and make you think that there’s no danger. You don’t even need any previous experience or special skills, so is PayPal Money Adder a great way for everyone to receive free money? This PayPal Money Adder scam has existed for some years already and the fact that there are scammers creating them it’s an indication that there are still people falling for it. Some claim you can get $1500 in a day and others only require you to provide your PayPal email address. They show you proof and some websites also have positive comments concerning these PayPal Money Adders, but they are all fake. Scam artists create multiple accounts and write the comments themselves, just to get you to believe that it’s real. They do the most to trick you into falling for this, and believe me when I say it can be more dangerous than you may think. Click Here To Get My FREE Step-By-Step Earn Money Online Guide! PayPal Money Adder was not created to help you with your finances. The truth is that this software or tool has been designed for the con artists to make money at your expense. They do the most to make it look like it’s a real opportunity to get instant cash but the truth is that the ones who will profit are the scammers themselves. Don’t be fooled by those screenshots or positive comments you see on these websites that provide these PayPal Money Adders. I came across one of these fraudulent websites and noticed that the owners don’t show up, which is something that doesn’t surprise me. Why? Because I have exposed lots of scams on this website and have realized that the ones who don’t show up are usually scam artists. There’s no way to know the people who have created these money adders, but what I know for sure is that their goal is not to add money to your account. If you think about it, it would make no sense that someone gave you free money for nothing. So what will it happen if you use a PayPal Money Adder? Let’s see. These con artists will do the most to get your money for nothing in return. Some PayPal Money Adders will ask you to make some kind of payment to download or get access to them, so the only way you will realize it doesn’t work is after you have paid for it. Therefore, if you pay to download a PayPal Money Adder, you can say bye to your money because they don’t work and there’s no way you can get a refund. Another way they can take your money is by asking you to verify you are human, since they can ask you to complete offers or surveys and they will make money whenever you take action on those offers. The more people who try this PayPal Money Adder tool, the more money these scammers will make. Some of these tools don’t require you to download them or provide your name, but all of them require you to give them your PayPal email address. They want to collect as many email addresses as possible to sell them to other scammers or companies who want to advertise their products/services to. Therefore, if you give them your main email address, you can expect to receive unwanted and spam emails that you don’t want to mess with. I personally don’t recommend that you open those emails because some of them might contain links to other scams. There are PayPal Money Adders that can ask you for your password as well, which is a big red flag. If they have your password, they will try to access your PayPal account or any accounts that you have. They will use your information to login to your accounts so I don’t recommend that you give them any personal data. In case they manage to get access to your PayPal account, they will steal your money and will even try to get access to your bank accounts liked to PayPal and steal as much money as possible. Not all of these fake money adders require you to download them, but you need to be careful with the ones who do. They might contain some kind of malware or viruses that you only find out once you have downloaded the software/tool. It can be very dangerous because it could be a software that spies on you to steal your personal and financial information. I suggest that you don’t download anything unless it’s from reliable websites. These con artists will do the most to get your information or money so you need to be careful because they can come in different shapes and forms. As I have mentioned, some are downloadable and some are web-based but they all have the same goal which is to get your hard-earned money or information. 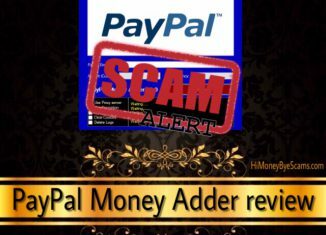 There’s no doubt that PayPal Money Adder is a total scam that you need to stay away from. I have reviewed hundreds of products and money-making opportunities and some of them could also be considered scams, but not total scams. I mean, some of them provide something for your money so I don’t call them a complete scam. I only call something an absolute scam when it wastes your time, takes your money and leaves you with nothing. This PayPal Money Adder scam is no better than other scams like BannerBit, ClicksDealer or Bitcoin Trader. Just from the beginning it makes no sense because there’s no place on the Internet where you can go to get money on demand. If you think about it, everyone would be using it and a lot of people would have quitted their jobs. I know I would tell my family and friends to use this amazing tool and they would be very happy, wouldn’t you do it as well? Money doesn’t come without doing any work so don’t believe anyone who tells you otherwise. Everyone would have already made a fortune online if PayPal Money Adder tools were real. I’m tired of scammers who take advantage of hard-working and innocent people to make money themselves, so I’ve made it my mission to help people avoid these frauds. Because of everything I have explained, I highly don’t recommend any PayPal Money Adder. When it comes to making money online, there are more fraudulent sites than legitimate ones. What you need to keep in mind is that earning online is not easy or fast, so there’s no push-button system or software that you can use to get money. The good news is that it is more than possible to make a consistent income online because many people (myself included) are doing this. I remember how hard it was for me to decide which route to take as there are too many programs out there, so I’m grateful that I found a legitimate platform and sticked to it. Thanks to their training, I learned how to use a beginner-friendly business model that has helped me make a consistent income month after month and never looked back since. This business model will allow you to make money from lots of products and services that are being sold everyday. You will also get access to step-by-step training that will help you get started and the best part is, you can start today for free! Not only that, you will also get the chance to get free help and support from me and other like-minded people. See my guide for details! Are you ready to leave the dangerous scams behind and start building your future today? I hope this PayPal Money Adder scam review has been helpful to you and you will make the best possible decision. Feel free to share it with whoever you believe that will benefit from it! some has really used our money to our expenses. and the worst part, this particular fraud has accelerated to a certain point as if its modernised and legalised. IT IS LEFT FOR US TO BE CAUTIOUS AND ALSO VERY CAREFUL. Glad to hear that you found this PayPal Money Adder review helpful! I hope people will avoid this fraud at all costs. Wow this not only seems like a a scam, but down right illegal. Just so I’m getting this right, they claim all you have to do is give them some personal info and they will out of the goodness of their hearts give you free money? That’s like someone coming up to you on the street asking for your personal bank details and PIN number so they can give you free money. It’s obvious this is a scam and like you said just a way to steal your money and personal info. I know I for one will not be buying this. Yeah, that’s the concept. They ask you for personal data so that they can give you free money lol, it sounds very unrealistic. Many people would be using these PayPal Money Adders if they really worked. It’s unbelievable what lies they’ll push down your throat to make you buy the system, to then run away and disappear with your money. There is no such thing as a free lunch. It’s crazy how they believe people will fall for this. I feel really bad though, because there are tons of people that don’t know how the online world works.Thanks to your review, many more people will become more educated and will be steering clear of this scam. You are right. There’s no free lunch so I guess these scammers are taking advantage of people who still don’t know that the Internet is no magic place and making money online is no different than making money offline. I hope people will do their research and avoid getting involved in these PayPal Money Adders scams. I had no idea about the PayPal money added scam! Thank you for the amazing information you offered I will be sure not to fall for this one and stick with your method of making money! Not ever is aware of the scams that are out there and you are doing a great job of keeping us informed! There are so many scams out there and they come in different shapes and forms so sometimes it’s not easy to recognize them. wow, this is so amazing, i just got $15,000 from help of encrypt hacker service. they are one the best hackers, because they keep their promise. you guys can also try it out,,. I had to remove your email address because it is considered spam. This section is for people to comment about PayPal Money Adder, not to promote other things that are not going to benefit people looking for a genuine way to earn money online. Evergreen Wealth Formula review – All SCAM SIGNS revealed!